The hills are rolling and crumbling at the same time. The wheat that whispers in the wind sticks sharply into my legs as I shuffle across the field to join the group of colorful shirts surrounded by dull green shirts and dull metal. The morning is crisp and calm. The ritual is the same. Palestinians farmers and their young children declare their intention to work land claimed by settlers, the army rushes down to prevent them, settlers look on from a far, the international and Israeli activists stand tweeting and twittering, video cameras in hand. Step one-two, step two-three, step three-four, step one-two. Today there are no clashes. Today the dance is tired and ritualistic. A white jeep bounces over the crest of the hill, and the air is lifted: Ezra. 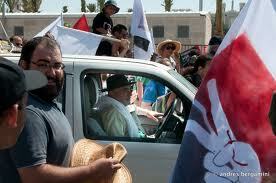 The Palestinian farmers laugh and say, “get the hajj Ezra some tea.” Everyone knows him by name. The soldiers mutter to each other, all of them know him by name also. Ezra gets out of the car, grinning and speaking Iraqi-Israeli Arabic that bounces smoothly like a white truck over rocky ground. Two of the small boys run over to him. 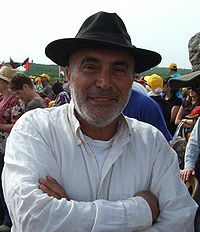 “We got a call,” Ezra says, telling whoever is listening –soldiers, activists and farmers– of a Palestinian farmer nearby who caught settlers poisoning his well– likely his main water source, as the villages in the South Hebron Hills are not connected to any grid, despite pre-dating the Occupation and Israel itself. This is part of the ritual, I remember, step one-two, step two-three, part of the game here is that in the process of dancing, Palestinians regularly have their property destroyed, the livelihood crushed, sometimes their lives taken, and they are not asked whether they want to dance. “Go with him,” Ezra tells and us, and the jeep is fading into the distance, green jeeps in tow, before we have fully stepped out. I met Ezra a few days after I first arrived in Jerusalem in the Fall of 2011. Members of the Rabbis for Human Rights legal team were heading out to the West Bank to research a case concerning a settlement’s expansion of its “special security area” onto more private Palestinian land. Ezra was then to me as he has been each of the many times I have seen him since: gruff, distracted, teasing but with eyes echoed a deep kindness. “You speak Arabic,” he says to me, in Arabic. “How does a nice religious boy like you know Arabic?” I laugh, adjust my kippah, and look out the window as we bump through the dust and rocks. Ezra Nawi, an openly gay retired plumber whose parents came to Israel from Iraq, is a man who has dedicated his life to others and to this place. Each week, he drives over 1,000 kilometers, shuttling activists, lawyers, journalists throughout the fraught and justice-draughted South Hebron Hills, visiting Palestinian farmers, villagers, families. Everyone knows him. From what I’ve seen, most Palestinians respect him deeply –with a high degree of mutual amusement– and many settlers and soldiers loath him. He is rougher than the rest of the activists, he tells the soldiers directly that they are committing horrible acts, tells them to go home, tells the settlers that he thinks they are doing evil things. But he has a softer side, as well, and when the dance shifts from ritualistic to serious, when people living in these Palestinian villages are hurt or threatened, it is then that the compassion which is his motor and engine shine through. Speaking of motor and engine, though, riding in his jeep often feels like a trip back to the late 1980s. This jeep is possibly the single most important material resource for those seeking to bring justice and break the cruelty of occupation in South Hebron through committed nonviolence, human compassion, direct action and access to information. And this jeep is quite literally crumbling. And so, I am turning this post, which I started writing as a reflection on my recent trip to South Hebron this past weekend, into an ask: Please help donate to buy Ezra a new truck. This is incredibly important. I don’t often make fundraising pitches (the last one I did was also connected to Ta’ayush, the South Hebron Hills, and the stark injustices that take place regularly there).